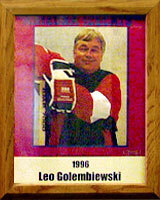 In the fall of 1996, Leo Golembiewski entered his 18th year as the only coach of the UA Icecat Hockey team (which he founded) having accumulated a record of 338 wins, 74 losses and 9 ties. His winning percentage of 80.1 is the highest in collegiate hockey! The Icecats have been in the National Tournament for an unprecedented fourteen straight years and won the National Championship in 1985. Each season since, they have been ranked in the top five in the nation. An outstanding high school athlete at Benet Academy, Lisle, Illinois, Leo lettered in tennis, baseball, and hockey. He earned his undergraduate diploma at St. Procopius, where he starred four years as All-League and tournament All-Star goalie. Then came a stint with the NHL St. Louis Blues. He taught History and coached hockey and Lyons Township HS in Illinois where his teams won 302 games with only 43 losses and 12 ties, giving him 640 career wins. Arriving in Tucson in 1977, “Mr. G.” taught American Government at Salpointe HS while earning his Master’s at the UA, and beseeching the Athletic Department to allow him to start a hockey program. That program, which annually draws more than 108,000 fans to the Madhouse on Main Street (TCC) is the third largest draw in all of college hockey. He has been president of the American Collegiate Hockey Association and his constant charity work is spearheaded by the Annual Leo Golembiewski Celebrity Golf Classic for MDA and by his work with troubled kids.